Raw & savage Black Death Metal in the old terror vein. 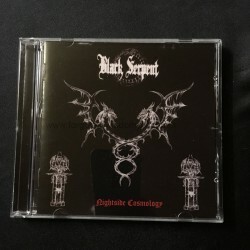 Debut mini-album, the first strike of pure Dark Occult Metal Art in the extreme Black Serpent style. Ancient Nightcult Worship !Influenced by bands like Beherit, Blasphemy, Bestial Warlust, Sepultura and Varathron ! OFFICIAL FRENCH DISTRIBUTION BY FORGOTTEN WISDOM PROD !!!! !